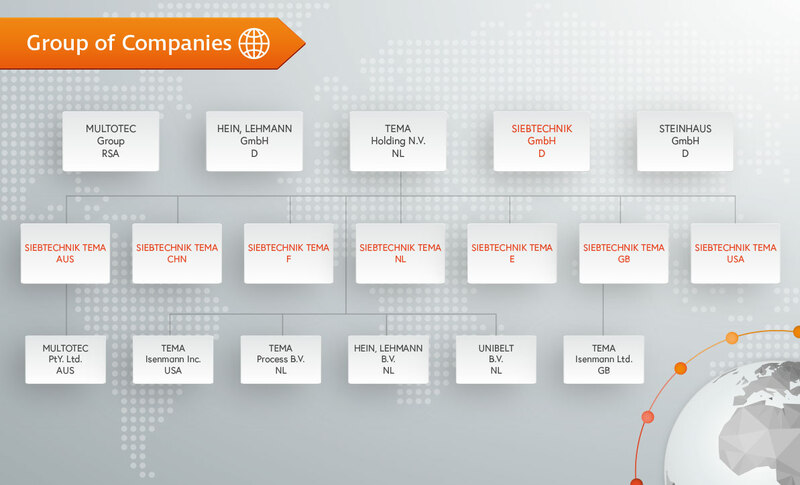 Since 1 January 2019, SIEBTECHNIK TEMA has been the umbrella brand of SIEBTECHNIK GmbH, founded in 1922, and of several companies of TEMA Holding N.V., founded 1925. SIEBTECHNIK TEMA is part of a globally operating group of companies with around 3,000 employees in more than 50 companies with a clear focus on the processing of mineral bulk solids as well as solid-liquid separation in the chemical and food industries. A company policy of controlled, self-financed growth, which has been consistently implemented in almost 100 years of company history, not only ensures a healthy economic base and an exceptionally good strategic position, but also an impressive worldwide presence. We see the challenges of the globalized world market as an opportunity for further positive corporate development.